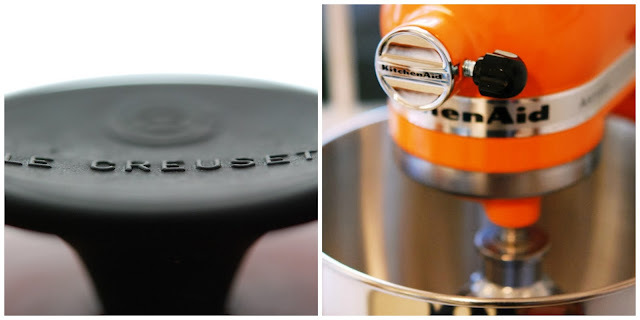 I’m so attached to my OSU orange Kitchen Aid and my Le Creuset pans, I’m having separation anxiety already. My dutch oven has been used over 1600 times during its run in my kitchen. My favorite recipe? No-Knead Bread. Did I tell you that the Le Creuset dutch oven creates the most exquisite crust? I used my Kitchen Aid more than anything else in my kitchen besides my pans. It was also the only color in my totally black and white kitchen so it was always the star. Appliances and gadgets have come and gone but my pans and my mixer were here to stay…until now. They are the foundation of all the good things that came out of my kitchen. As I head off to Mexico, I realize that there are few things that I’ve been attached to over the years. Le Creuset and Kitchen Aid are two of them.